i realize that i posted a chocolate mint dessert not 4 days ago. i know i know i know. but i somehow happened upon two great, similarly flavored recipes within the same amount of time (they were in the house concurrently). and they’re actually different- this one is definitely more of a BANG HAPPY NEW YEARS kind of deal, what with it being cake (which is always a celebration tool), and the chocolate crumble is most certainly special, even if it kind of looks like dirt. i’m going to plead the “delicious not gorgeous” card on the crumble. and i had to post this now because i’m running out of time where chocolate mint things are festive (though i will argue that the flavor is always socially acceptable). these were for scooter‘s birthday a couple weeks ago. she loves chocolate mint anything (2 of the 3 times we’ve gone to disneyland together, she’s gotten a chocolate mint sundae), and chocolate is her weakness (her big can smooth over anything with her if he gives her chocolate). the cake was incredibly moist, as always, even though i’m fairly certain they were overbaked this time (THANK YOU INA/BEATTY), and it grew impossibly more chocolatey on day 2. the frosting was a teensy bit separated, but still creamy, minty, and lightly sweet unlike the typical american buttercream. the crushed candy added another hit of mint, along with a bit of crunch. but people, the real star was that chocolate shortbread crumble. it was buttery and added an admittedly unnecessary, but completely welcome even though i’m mildly craving veggies, decadence. In another bowl, combine the buttermilk, oil, eggs, and vanilla. Slowly add the wet ingredients to the dry. Add the coffee and stir just to combine. The batter will be very liquidy; you might want to transfer it to a liquid measuring cup so that you can distribute it more easily into the muffin cups. Pour the batter into 24 lined muffin cups and bake at 350F for 18-20 minutes, until a toothpick comes out with moist crumbs. Cool in the pans for a few minutes, then cool completely on a cooling rack. Combine the dry ingredients. Add the butter and mix until the mixture starts to clump. Spread the clusters on a parchment-lined baking sheet and bake at 350F for 15 minutes, breaking them up occasionally. The crumbs should still be slightly moist to the touch after 20 minutes and will continue to dry and harden as they cool. Cool completely. Beat the butter until fluffy. Mix in the milk and extracts. Slowly add the sugar until incorporated. Add green food coloring until a desired shade of green is achieved, then beat until light and fluffy. Mix in the chocolate until combined. 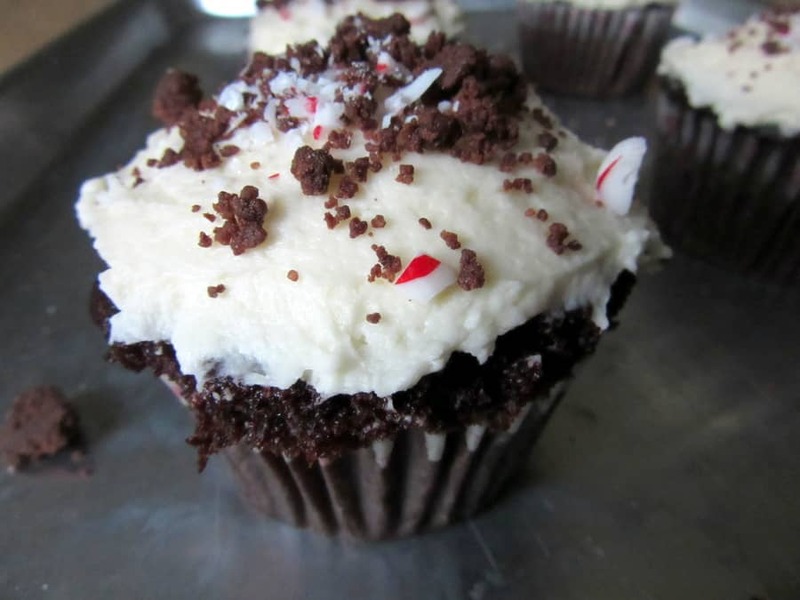 Frost the cupcakes with the mint buttercream. Sprinkle the tops with crushed peppermint candies and the chocolate crumble, pressing big pieces into the buttercream to slightly adhere.